Chinese hacking team of TaiG has released iOS 8.3 untethered jailbreak tool for all iPhone, iPad and iPod touch devices. 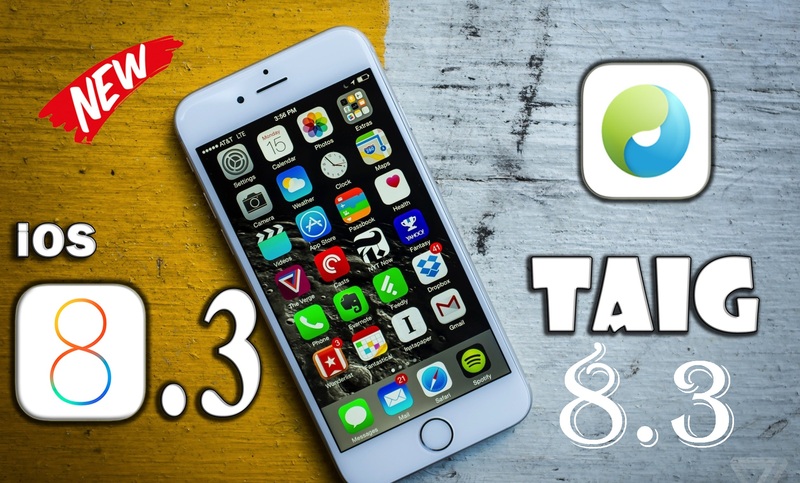 TaiG v2.4.3 is the latest iOS 8.3 jailbreak tool on windows for compatible iPhone 6, 6 plus, 5, 5s, 5c, 4s, iPad 4, 3, 2, iPad mini 1, 2, 3, iPad Air 1, Air 2 and 5th generation iPod touch. 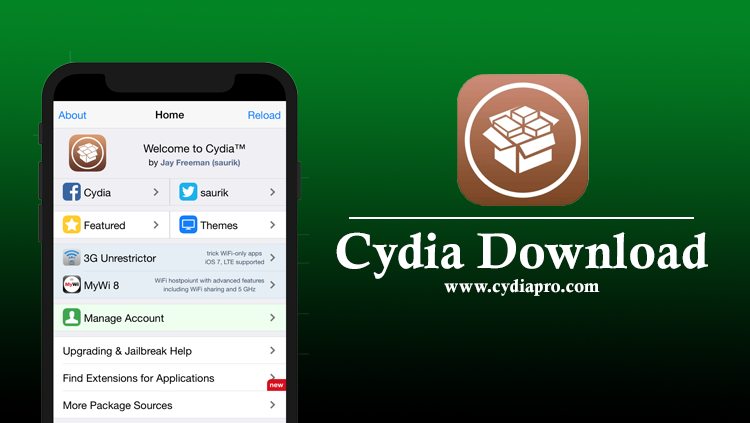 Jailbreaking enables to install unapproachable mods, 3rd party apps, custom themes, tweaks, utilities and other packages from cydia which are unavailable in App Store. Jailbreak let users to move their idevices beyond the limit. To break your idevice limit go through the our article. It will guide you to jailbreak iOS 8.3 iPhone, iPad and iPod touch. Don’t forget to take device backup your data through iCloud or iTunes before run the jailbreak process on your idevice, as there are some issues like data loss that while the process going on. Enable the mode of the Airplane in the device’s settings app. Disable the “Passcode or Touch ID” and “Find my iPhone” features through the settings app in your idevice. Close the all anti virus programs or firewalls. If you escape to switch off, then sometimes jailbreak entrance will close by antivirus software, because they identify jailbreak like the thread. You must check your idevice’s battery. Don’t allow to drain your idevice’s battery while the process. Need to download TaiG latest version as 2.4.3 from the TaiG’s official web page. Attach your iPhone, iPad or iPod touch to computer using USB cable. Unzip the TaiG zip file and open it as an administrator. TaiG will take few times to detect your idevice itself. After that shows the jailbreak window on your computer screen. Don’t forget to remove the tick of the 3k assistant checkbox below to cydia 1.1.23 and click on the start button. Don’t touch anything, because process is running on your device system. After that your iPhone, iPad or iPod touch will reboot automatically. Cydia icon can see on your idevice home screen. It means that process succeeded. If I failed on TaiG jailbreak? Don’t worry with “jailbreak failed” message. You can restart the process without any doubt. If you forget to disable both passcode lock and find my iPhone, then it will be the main reason to jailbreak failed. So before the process please double check our device preparation guide. The Chinese hacking team of TaiG updated iOS 8.3 jailbreak new version of TaiG 2.1.3 with fixed all errors in pre-TaiG versions of TaiG v2.0 and TaiG v2.1.2. Now all users can download TaiG v2.1.3 and it is compatible for all iPhone, iPad and iPod touch. If you had any problem after use TaiG v2.0 or TaiG v2.1.2 jailbreak, then use TaiG v2.1.3 jailbreak. 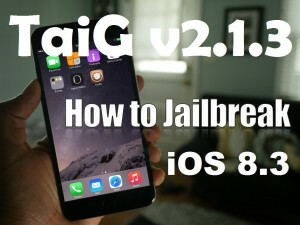 If you have a already jailbroken iDevice across the TaiG 2.0 or TaiG v2.1.2 jailbreak then no need to re-jailbreak. Long startup time of iPhone 4s, getting stuck at 20% issue, the issue of TaiG did not work on the virtual machine fixed via TaiG v2.1.3 jailbreak. especially TaiG updated latest Cydia 1.1.12 and UIKitTools 1.1.1.0 with the new jailbreak. Using iTunes or iCloud take full backup of your all important data. If your data loss with device crashing, then users can restore their iDevices via backup. So please don’t forget to do device backup earlier the jailbreak process. “Find my iPhone” option need to be disable beforehand the process. The option will helps to find location of lost phones. Log to the Settings app on your phone and navigate to the iCloud. then tap on “Find my iPhone” and divert into turn off. Turn Airplane mode on your phone on. Off all anti-virus programs which are running on your device system for secure your data from malware or spyware threads. If you forget to turn off virus protectors then Jailbreak process will detect as a virus by virus guards. After that virus guard will prevent of jailbreak. because of that you need to be turn off all virus guards before begin the process. Step 1 – Download TaiG 2.1.3 version on your computer. Step 2 – Connect your iPhone to your windows based computer using the USB data transfer cable. Step 4 – Take out the TaiG downloaded extension and right click on and select “Run as Administrator “from the list. Step 5 – Let to TaiG for detect your device itself. TaiG will take few minutes to complete its work. Then TaiG will launch the jailbreak window on your computer screen. Step 6 – Need to unread 3k Assitant checkbox. Use the tick to unmark the option and press on the “START” key to begin the process. Step 7 – The progress bar will start to filling. At the end of the progress bar your device will start to reboot at once. Then TaiG will inform across the cydia icon, that the jailbreak succeeded. TaiG is going to release iOS 8.4 jailbreak tool so soon. 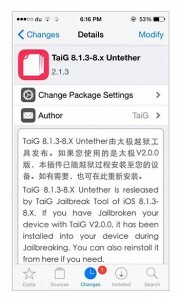 The Chinese hacker group of TaiG has just announced their new jailbreak tool update of TaiG v2.1.3 with fixed several bugs as the UI Cache bug, the jailbreak process getting stuck at 20% and 60% and the long startup time issue of iPhone 4s. TaiG v2.1.3 jailbreak is supported all iPhone, iPad and iPod touch including iPhone 6, 6 plus, 5, 5s, 5c, 4s, iPad 4, 3, 2, iPad mini, 2, 3, iPad Air, 2, iPod touch 5G. TaiG v2.1.3 is currently available to download. TaiG 8.3 jailbreak is usually running only on windows, no mac version yet. TaiG 8.3 jailbreak is like the shakiest jailbreak tool, because within few days TaiG updated TaiG iOS 8.3 jailbreak tool at three times. Taig v2.0 is the first iOS 8.3 jailbreak version and then they updated Taig v2.1.2 and latest one is TaiG v2.1.3. TaiG v2.0 jailbreak process is started to stuck at 20% and 60%. After that users did not possible to continue jailbreak process and TaiG showed jailbreak failed message. Not only stuck issue, the “Apple Driver has not been found” that is the other error which is complained by users.Users tired with those errors and they are reporting continuously. 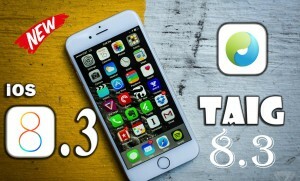 Then TaiG updated their new TaiG v2.1.3 download version for iOS 8.3 jailbreak with fixed several issues. TaiG v2.0 is their initially jailbreak tool for iOS 8.3 jailbreak. But it came out with number of errors. Then after a few days of TaiG v2.0, they updated TaiG v2.1.2. As their TaiG v2.1.2 release note they have told that they successfully fixed the issue of getting stuck at 20% with their new TaiG v2.1.2 jailbreak update. But according to users’ complains we did seem that the issues did not fix in TaiG v2.1.2. Now TaiG v2.1.3 new iOS 8.3 jailbreak tool updated with getting stuck issue and other errors. If you confronted problems with Taig v2.0 or TaiG v2.1.2 jailbreak, then now users can jailbreak their iPhone, iPad and iPod touch using TaiG v2.1.3 jailbreak. Already jailbroken iPhone, iPad and iPod using TaiG v2.0/ TaiG v2.1.2. Then? If you have already jailbroken your iDevices using TaiG v2.0 or TaiG v2.1.2 then don’t worry. Did not need to re-jailbreak. To update TaiG 8.1.3-8.x untethered package on cydia, add apt.taig.com repository and then you can see the screenshot which is given below. Then update it and install it. IMPORTANT – Be expect iOS 8.4 Jailbreak tool by TaiG. TaiG has just confirmed their new TaiG v2.1.2 jailbreak tool that addresses especially cydia substrate issue and number of other bug fixes which are the reported by users. The team of Chinese hacker TaiG, launched out TaiG v2.0 for untethered jailbreak iOS 8.3 to iOS 8.1.3 in nearly day. 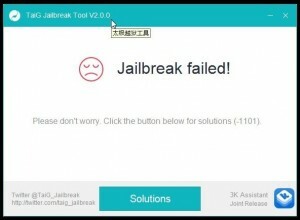 This is the TaiG’s third time of releasing jailbreak tool. With iOS 8.3 jailbreak tool releasing all cydia lovers are trying to reach cydia using TaiG jailbreak. Meanwhile number of users are reporting some errors of TaiG 8.3 jailbreak. However as complains, cydia substrate was not compatible for iOS 8.3 and most jailbreak tweaks and apps were not working properly. The “Apple Driver has not been found” error and “jailbreak process is getting stuck at 20%” error which are the main errors we did see from TaiG 8.3 jailbreak. Cydia substrate was developed by Jay Freeman aka Saurik. Jay Freeman is the founder of cydia. He had later indicated that TaiG must update the jailbreak kernel patch to fix those errors with cydia substrate. Fixed the blank settings issue while matching Apple watch with iDevice. Fixed the main problems of getting stuck jailbreak process at 20% and 60%. taiG v2.1.2 jailbreak is compatible with cydia substrate (mobile substrate). If you faced to problem with TaiG v2.0 jailbreak then you can use TaiG new update TaiG v2.1.2 for your iPhone, iPad and iPod touch. If you already jailbroken iDevice using TaiG v2.1.2 jailbreak tool then please update TaiG 8.1.3- 8.x through TaiG source or 3K source and no need to re-jailbreak. If you see the “Storage Almost Full” message then please run Cydia. If you failed with cydia then turn off Wi-Fi and try again. TaiG v2.1.2 jailbreak is compatible with all iPhone, iPad and iPod touch running on iOS 8.3 – iOS 8.1.3. Take full device backup beforehand run the taig jailbreak. Device Passcode or Touch ID and Find my iPhone options must be disable. Download TaiG v2.1.2 and connect your iDevice and PC through the USB data cable. Uncheck 3k Assitant app after the device detect and click “Start”. Back of jailbreak progress bar filling, your device will reboot automatically. Then you can take out cydia icon from your device home screen. In nearly day TaiG pushed out iOS 8.3 untethered jailbreak tool of TaiG 2.0 version for all iPhone, iPad and iPod touch running on iOS 8.2, iOS 8.3 and iOS 8.1.3. iOS 8.3 jailbreak compatible devices – iPhone 6, 6 plus, 5, 5s, 5c, 4s, iPad 4, 3, 2, iPad mini, 2, 3, iPad Air, Air 2, iPod touch 5G. More than millions of cydia lovers are gathering with TaiG 8.3 jailbreak because more than two or three months they expected to install cydia iOS 8.3. Cydia is the 3rd party application that can be installed at the end of the jailbreak process. Jailbreak is like the entrance for the cydia. However few days back of TaiG 8.3 jailbreak release, some sources are indicating number of errors in the iOS 8.3 jailbreak. Additionally they reported that TaiG is going to release the new TaiG jailbreak version called TaiG v2.1 with fixed errors. A number of TaiG jailbreak runners are reporting to TaiG that TaiG 8.3 jailbreak started to stuck at the 20% and then it shows the jailbreak failed error message (-1101). They complained that the process only came only on 20%. The “jailbreak is getting stuck at 20% error (-1101) is not the only error which found users while the TaiG jailbreak process. The “Apple Driver not found” issue that is the other issue reported by users. If you faced this jailbreak stuck issue, the follow these steps to fix that error properly and then you can jailbreak your iPhone, iPad and iPod touch using TaiG 8.3 jailbreak. You need to take full backup of your important data because backup will useful to any device data losses. Press twice on the appropriate iTunes downloaded exe file. Follow the instruction as you normally do to install iTunes. Apple’s iOS 8.3 successfully rolled out among billions of Apple fans as non-jailbroken iOS software update. There is currently not available iOS 8.3 jailbreak possible announced by any jailbreak hacker or group. Although now a days, experiments are going on for iOS 8.3 cydia. In same raw Apple has confirm the newest iOS 8.4 beta 1, beta 2 in testing period before release iOS 8.4 as major version. The famous hacker of Stefan Essar released iOS 8.4 beta 1 jailbreak possibility via YouTube. In fact we can hope that iOS 8.3 also can jailbreak for download cydia on iPhone, iPad and iPod touch which is running on iOS 8.3. Apple has fixed some bugs in pre beta versions and introduced new user features like redesigned Emoji keyboard, CarPlay Wirless and Siri language via iOS 8.3. TaiG jailbreak, evasion, PP jailbreak and Pangu jailbreak do not work for iOS 8.3 jailbreak, because Apple has patched list of vulnerabilities in iOS 8.3. According to the state, iOn1c’s video is the one of the prediction about iOS 8.3 jailbreak which is available presently. All fellows, if you currently use idevice witch is running on iOS 8.1.2 or lower, should not upgrade your device into iOS 8.3, because iOS 8.3 jailbreak tool still could not find. In fact, until confirm jailbreak possibility you should stay out upgrading. You will loss in jailbreak with cydia when you ignore our statement. Users who are installed iOS 8.3 currently, you must wait for release iOS 8.3 jailbreak tool. All fellows can download iOS 8.3 and update software via online or OTA, but OTA updates are will not work with iOS 8.3 jailbreak in future. Now a days, via some websites are taking about TaiG 8.3 jailbreak for iOS 8.3 jailbreak, but keep in mind iOS 8.3 jailbreak tool is not available yet. We cannot hope on TaiG jailbreak pre versions, although we hope to immediately somebody will disclose a solution for iOS 8.3 cydia download. You should stay until iOS 8.3 jailbreak tool release officially. Apple has finally released iOS 8.3, well-back of beta confirmations. Fixed some bug fixes, enhanced some improvements and new redesigned Emoji keyboard, Carplay wireless and new siri language included like modern features. All users can download iOS 8.3 directly online or otherwise like OTA updates (Settings > General > Software update). OTA updates aren’t work with jailbreak, therefore the better thing is iOS 8.3 update via online. Some important thing have to must be attention, If you use iPhone, iPad and iPod touch running on iOS 8.1.2 or lower, I think that better thing is stay out iOS 8.3 update, because it will loss jailbreak with cydia, tweaks, apps and all. Stay until confirm iOS 8.3 jailbreak, because you haven’t jailbreak possibility to install cydia iOS 8.3 yet. I did not mean that iOS 8.3 jailbreak not release ever. In nearly day all users can possible to heard a good news about iOS 8.3 jailbreak via TaiG, Pangu, evasion or otherwise PP or any other jailbreak community. TaiG is theuntethered jailbreak tool which is developed by TaiG team. According to the in past jailbreak succeeded report, they continue their brand name that high success tool for idevice. Therefore all cydia lovers are expecting that iOS 8.3 jailbreak will release TaiG firstly. According to rumors statements which are spreading via internet, TaiG 8.3 jailbreak is the latest TaiG version witch is release in futures. In same raw Pangu, evasion, PP and many more jailbreak communities work hard to find a application to jailbreak iOS 8.3 cydia download. Pangu also comes up with their succeeded jailbreak tools for iOS 8. But in present, Pangu did not update to the newest. Therefore we cannot 100% sure about Pangu like PP jailbreak, because PP only available for Mac OS. Our review immediately TaiG, Pangu, evasion, PP or other jailbreak team will reveal a tool to jailbreak iOS 8.3. You must stay until expose iOS 8.3 cydia download solution all users who are fanatically about cydia. TaiG is the untethered jailbreak tool, developed by TaiG Jailbreak community and they famous all over the world with their tools, jailbroken iOS versions successfully in the past. TaiG is the leading jailbreak team among the other jailbreak gathers. 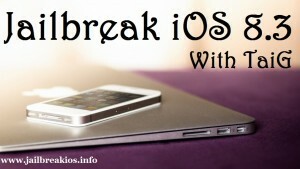 We can say that TaiG is the leading jailbreak team who is jailbreak lots of Apple’s iOS properly. I think otherwise you will attest that TaiG will famous day by day. Now a days via internet spreading rumors about TaiG 8.3 for jailbreak iOS 8.3. But it is not available yet. After Apple’s beta versions, they increased their security updated with released new iOS 8.3. Redesigned Emoji keyboard, new Siri language, carplay wireless and lots of bug fixes and list of other improvements delivered via iOS 8.3. The latest iOS designed for all iPhone, iPad and iPod touch. You know after every iOS release, cydia lovers and jailbreakers start their experiments to find a tool to jailbreak Apple iOS. Likewise TaiG, Pangu, evasion, PP and many more teams did their experiments. TaiG is the main jailbreak community who is working hard to find a tool for jailbreak iOS 8.3. Most users are expected that TaiG will be the first jailbreak team for iOS 8.3 jailbreak. They expected that quite, TaiG newest one will name in TaiG 8.3. When will be TaiG release TaiG 8.3 ? Now all users are keeping hope on TaiG 8.3 to cydia download iOS 8.3. According to rumours they said that TaiG will update within next couple of weeks to jailbreak iOS 8.3. We think that the latest TaiG 8.3 will release soon with ton of cydia tweaks, bug fixes and other improvements like TaiG’s previous versions. You must need to stay a few time until confirm TaiG 8.3 officially. TaiG has updated periodically like TaiG 1.1, TaiG 1.2, TaiG 1.1 English and TaiG 1.3 (the latest TaiG version at the moment). TaiG 1.1 to jailbreak iOS 8.1.1, TaiG 1.2 to iOS 8.1.2 jailbreak and TaiG 1.3 jailbreak iOS 8.2 beta 1/2. All TaiG jailbreak versions introduced to of cydia tweaks for their fellows. TaiG is the not only one jailbreak community who is doing experiments to find a solution to jailbreak iOS 8.3. But I think TaiG will update into TaiG 8.3 to jailbreak iOS 8.3 firstly, sure. 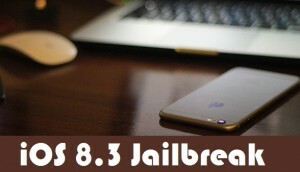 Apple released iOS 8.3 download software update version to their idevice users few days back but there’s nothing seems good news about iOS 8.3 jailbreak. All cydia lovers are waiting for jailbreak their iOS 8.3 upgraded idevices. We think Apple killed TaiG jailbreak and Pangu jailbreak possibilities with iOS 8.2 and iOS 8.3, because any jailbreak team could not announce their iOS 8.3 jailbreak utility yet. TaiG announced that they completed their iOS 8.2 jailbreak, but it does not confirm yet. So now we are expecting that even TaiG will release iOS 8.3 jailbreak tool immediately. iOS 8.3 download available on Apple company website. Users can upgrade their idevices into iOS 8.3 with many more benefits, such as emoji keyboard, bug fixes and various improvements. But keep in mind iOS 8.3 cydia download possibility haven’t yet. Therefore we thinks better is don’t update your already cydia install idevice until iOS 8.3 cydia possibility confirm. You must waiting for iOS 8.2 and iOS 8.3 jailbreak, because it has waiting listed. Otherwise you can jailbreak iOS 8.3 idevices with astray path, such as you can download cydia iOS 8.3 with Pangu8, taiG or Evasi0n. But keep in mind it does not officially. This is the guide of iOS 8.3 jailbreak with Pangu8. Requirements earlier than running Pangu8 iOS 8.3 jailbreak tool? You might have to disable Passcode or Touch ID, Find my iPhone and all anti-virus programs. It always recommended full device backup earlier than start the process. Use iTunes or OTA for iOS 8.3 updates. Need proper USB data cord, windows based computer and it takes 20-30 minutes to complete process. Pangu is the high success jailbreak brand name in the whole world. After iOS 8.3 release, they began their experiments. we can guess Pangu8 jailbreak developers will relase for this. Most probably it will be Pangu 8.3 or Pangu 8.3.1 otherwise Pangu 8.3.2. many more features, cydia tweaks, bug fixes will be expected with this new iOS 8.3 jailbreak tool.